For people who are looking for a new place to call home, many are attracted to the perks of Memphis. Not only has it gained recognition as one of the happiest cities to work in, but it offers a low cost of living, as well. New developments are also happening in Memphis, with new businesses deciding to set their roots in the city. What else could there be to boast about? Obviously, the weather is great, too, giving you every opportunity to stroll down the historic district or go biking, hiking, fishing, or boating. The city is also filled with music, history, and many friendly faces. If you are thinking of making the move to Memphis, consider using car shipping services. A move can be quite the challenge. You need all the help you can get. Using a professional auto transport company will help ensure that your move to your new home goes smoothly, from start to finish. Learn more about Tennessee Car Shipping Services. When it comes to getting your car to your new home, you have two main options. You can either drive it yourself or hire an auto transport company. It is better to ship your car than to drive it across the country. If you ask us why, here’s what we will tell you. If given the option, most people would choose the travel option that means getting to their destination quicker. Driving your car to another city is difficult because of the amount of time that is required. It can hours, or even days, to complete your trip. By shipping your car, you don’t have to worry about anything. All the hard work is done for you. With door-to-door auto transport services, the car will even be delivered directly to your home, making it convenient for you. Fueling up at gas stations, stopping at restaurants for food, and sleeping at hotels for the night can really add up. You don’t have to account for all these expenses when you ship your car, because traveling to your destination is easy. Traveling, especially long distances, wears down your car’s tire and can impact your engine. All of this wear can contribute to the resale value of your vehicle. You may be concerned over added mileage, which comes with road trips. You can protect your car from these factors by shipping it, instead. Memphis is a great city for people who love the deep roots of The South, a low cost of living, and a high quality of life. It is a great mesh between energetic city life and a sense of neighborliness that comes from living in the South. Memphis has one of the lowest costs of living found in a large metro area. The cost of living is less than the national average. In addition, housing in Memphis is significantly lower in cost than other large metropolitan areas. The national average for home prices is close to $212,000, but in Memphis that number is just below $155,000. The national average to rent a two-bedroom home is close to $1,100, but in Memphis that may only be $850. The job market in Memphis leaves room for improvements. There are hopes for more expansion and developments to create more employment opportunities. The unemployment rate is slightly higher than the national average, and the average annual income is below the national average. However, there are several Fortune 500 companies that are headquartered in Memphis. The companies bring in several thousand jobs per year. Depending on whom you talk to, the job market is either great or bad in Memphis. Some people have it listed in top ten and top 100 lists, while others say that Memphis is not worth it. The best advice we have is to do your own research and figure out if Memphis is compatible with your field of work. Compared to many other cities, Memphis has pretty mild winters with average low temperatures in the mid 30s throughout the coldest month of the year. Summers are warm and humid, but rarely reach above 100 degrees. Overall, Memphis gets more sunny days than the rest of the country, but they do receive greater rainfall, so pack a lightweight rain jacket. Spring is warm, while fall is cool and colorful. The beautiful weather often has residents enjoying outdoor activities such as hiking, cycling, swimming, and walking. 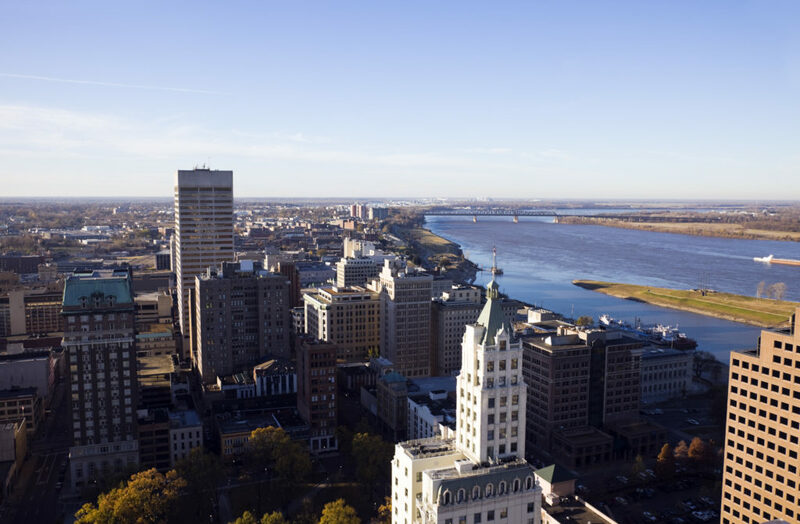 If you plan on moving or visiting Memphis, here are a few fun facts that you might want to know. Elvis Presley is King. He is celebrated at Graceland. His former home gets thousands of visitors each and every year. Tennessee is home to all kinds of music. Rock music was born in Memphis at Sun Studio. The Peabody Duck March is a big deal. Every spring, the Peabody Ducks march to and from the Grand Hotel and take a dip in the fountain. It may sound trivial, but it is a long-standing Memphis tradition. The outdoors are celebrated here. Whether this is through activities or landscape, you will be sure to find something you enjoy. Memphis is home to many parks, gardens, and nature centers. People are genuine. You will find that people are real and honest. For most, this is a breath of fresh air, but for others it may be off-putting. National Dispatch is a leading provider of car transport services for customers who would like to ship their car anywhere in the United States. We pride ourselves in providing the best customer service you can find and shipping your car in the safest and fastest manner possible. Unlike many of our competitors, we offer a free, instant car shipping quote that requires absolutely no personal information. If you prefer to speak with an auto transport representative, call us at 800-321-2051. A move is difficult, no matter how you look at it. Now that you have figured out who will be transporting your car, you must also decide how you will be getting your household goods to your home. Upon arrival in a new city, it can be hard to know which companies you can rely on for outstanding service. We have listed a few of our recommendations when it comes to your vehicle and more.